A woman named Alexa has a boyfriend who was supposed to receive an Apple iPad for Christmas from his mother who had ordered it from Best Buy. Instead, the box that arrived at the mother's house contained five tablets. Alexa asked her boyfriend's mom to double check to make sure that she didn't order five tablets by accident and when she was satisfied that the error was made by Best Buy, Alexa sent a letter to the electronics retailer informing them of the mistake. Best Buy never responded. So Alexa decided to contact The Consumerist. In the letter, she mentioned that her theory was that the person doing the fulfillment at Best Buy had slapped an incorrect shipping label on a box of five tablets. 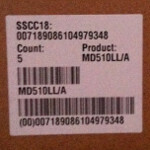 The box had a label showing it contained five tablets while the shipping label showed just one being shipped. Alexa had done research on the situation and found other situations where a company overshipped an order and rewarded the customer for stepping forward by giving them a gift certificate, But she could not find a situation where the mistake was valued at the price of four Apple iPad tablets. Alexa eventually found a document stating that if a package is mistakenly sent to you, you get to keep it. This is done to prevent scam artists from sending you items you didn't ask for and then billing you for it. So by law, her boyfriend's mom was the proud owner of five new Apple iPads. Meanwhile, The Consumerist was more concerned about the ramifications of the mistake on someone's job, so without mentioning names they got in contact with Best Buy. Eventually, Best Buy was put in touch with Alexa who received a letter that is sure to wet the eyes of every cold-hearted Scrooge. Best Buy told Alexa to keep the extra tablets and give them away to people in need, a charity, a local school, her favorite PhoneArena editor or friends and family. Best Buy couldn't have scripted this any better than if it were planned out in advance. So let's recap. Alexa's BFF gets his Apple iPad, Alexa's mom has four to sell on eBay to give away. Best Buy comes out looking quite charitable and perhaps there is now an opening in Best Buy's shipping department. Especially since the very same thing happened a few days ago to someone named Nick. 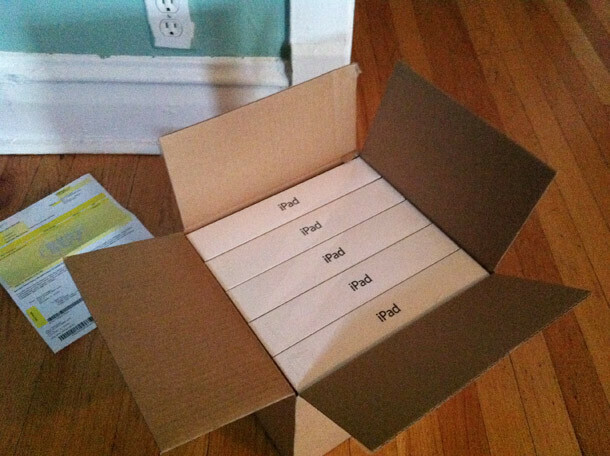 Nick ordered one iPad and received a whole box of five tablets. When he called Best Buy, he was told that the retailer shows that he only received one tablet, so Best Buy couldn't do anything about it. If the retailer continues to ship five Apple iPads to everyone who orders just one, it might be time to short the stock. Holy ****!!! Why god!!! Why I'm not the chosen one!!! why would anyone thumbs down a Merry Christmas to best buy? Wow that was very generous of Best Buy. 5 of the best tablets on the market is sure to brighten someone's christmas day. The article clearly said she got iPads. How did she get the best tablets. Id put the iPad in the top 3. Just imagine the resale value..
oh come on guys, who cares who hates what product and all! I may not be a fan of iPads and iPhones but if i received 5 and paid for only one then id be one happy person! He said "of the best". Even Android fanboys should acknowledge that yes, Ipad is one of the best. Whether its the best or not is debatable, but among the best should be more than true. That's not true, all she got where ipads.... Not the best tablets, a box with Nexus 10's that's the real deal. Mxy, you need to learn how to comprehend - the article did not discuss Nexus 10 tablets. Hmm, I wonder if they'll do this for good products... Wouldn't mind a box full box of Alienware laptops or Asus TaiChis, or a wall-full of TVs, haha. She could sell 4 of them, or three of them, on Ebay. With the money buy a Nexus 10...and have money to spare. I am not sure if 'needy' people's needs/priorities include getting some sort of tablet. Maybe the local school could use them. Give it to charity? Like GOODWILL? Why would someone who needs the basics need a tablet? Now, you could sell it on an auction site and give the proceeds to a charity - that would be better. why should she step backwards? ok, then sell all 4 - both are good tablets - one just likes to rip you off..or, one of the tablets could be used for buying an itunes or google play card. Right. Because you know so much about how a corporation works.